FILE - Rohingya refugees who have fled Myanmar’s Rakhine state, cross into Bangladesh at Palong Khali in the Cox’s Bazar district in this photo taken in mid-October 2017. A year after the mass exodus of minority Rohingya Muslims from Myanmar, the U.S. State Department has gathered information from survivors that substantiates accusations that the Myanmar military and security forces perpetrated atrocious human rights violations. "The firsthand accounts of the survivors reveal that a majority of the Rohingya directly experienced violence, either to their homes, to their families, or to both," U.S. Ambassador Nikki Haley told a Security Council meeting on the situation. "Most importantly, the report identifies one group as the perpetrator of the overwhelming majority of these crimes —the Burmese military and security forces," she said, using the other name for Myanmar. Haley said the State Department's findings are based on more than 1,000 interviews with randomly selected refugees in camps in Bangladesh. Some 700,000 Rohingya fled there following a brutal military crackdown after Rohingya militants attacked and killed a dozen Myanmar security forces. 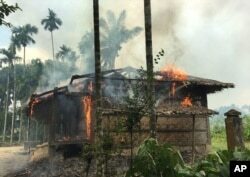 FILE - Houses are on fire in Gawdu Zara village, northern Rakhine state, Myanmar, Sept. 7, 2017. * 65 percent watched a family member or fellow villager be injured. "Children, babies, women and men suffered unspeakable crimes," Haley said. "The attacks were planned, premeditated and coordinated. The perpetrator was the Burmese military and security forces." Earlier this month, the Trump administration imposed targeted sanctions on five Myanmar military commanders and two units of the army for their involvement in the atrocities. The State Department findings echo those of an independent fact-finding mission established by the U.N. Human Rights Council. That panel released its report Monday. The panel concluded that the Myanmar military's response to attacks by Rohingya militants was "immediate, brutal and grossly disproportionate." The panel said it was also likely pre-planned. It named six Myanmar military officials, including Commander-in-Chief Senior Gen. Min Aung Hlaing, urging investigation and prosecution for crimes against humanity, including genocide. The panel urged the Security Council to refer the situation to the International Criminal Court at The Hague. However, veto-wielding council members Russia and China are unlikely to let that happen. Myanmar's U.N. envoy Hau Do Suan told the council that the militants' attacks and the inevitable military response and displacement were "carefully calculated, instigated and created" by the militants to undermine the government's efforts to find a lasting solution to the situation and to advance their own political goals. He said the government is ready to start receiving returnees but said none have returned. "It will take time and patience to build trust and confidence among communities," he acknowledged. In the meantime, the Rohingya refugees live in dire conditions in what is now the world's largest refugee camp. The U.N. said conditions are not yet in place for them to return home in a safe, voluntary and dignified manner. U.N. Refugee Agency goodwill ambassador actor Cate Blanchett told the council that refugees will move back home only when it is safe to do so. "The Rohingya cannot return to the very conditions they were forced to flee," she warned. "They cannot settle for half-solutions." Blanchett visited the Rohingya refugee camp in Bangladesh in March. She said nothing prepared her for the extent and depth of suffering that she saw. She implored the international community to take action to end the crisis. "We have failed the Rohingya before, please let us not fail them again," she said.